Go to original pattern for design DROPS 142-21. Set consists of: Knitted DROPS jacket and neck warmer in ”Alpaca Bouclé.” Size: S - XXXL. 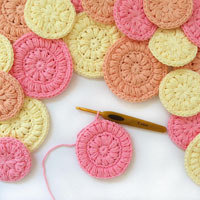 DROPS CIRCULAR NEEDLE size 5 mm / US 8 (60 cm / 24'') - or size needed to get 17 sts x 22 rows in stockinette st = 10 x 10 cm / 4'' x 4''. At beg of row from RS: Work 4-4-4-6-6-6 sts in garter st, * K 3, P 3 *, repeat from *-* 1 more time = 16-16-16-18-18-18 sts. At end of row from RS: Work * P 3, K 3 *, repeat from *-* 1 more time, 4-4-4-6-6-6 sts in garter st = 16-16-16-18-18-18 sts. From WS work the outermost 4-4-4-6-6-6 sts in garter st, and K over K and P over P over the other band sts. Inc 1 st in each side as follows: K 1, make 1 YO, work until 1 st remains, make 1 YO, K 1. On next row work YO twisted to avoid holes. Measure when piece is flat, it is important not to stretch the piece when measuring. 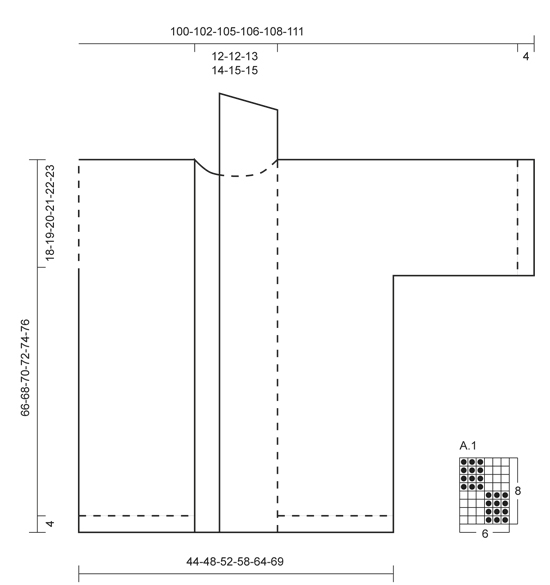 See diagram A-1, diagram shows all rows in 1 repetition of pattern. Worked back and forth on circular needle from mid front. 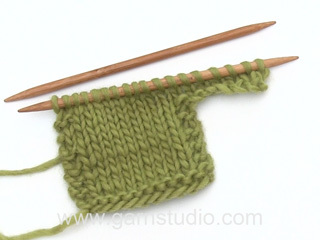 Cast on 160-176-186-208-226-246 sts on circular needle size 5 mm / US 8 with Alpaca Bouclé. On 1st row (= RS) work as follows: Work BAND STS - read explanation above, work in GARTER ST - read explanation above - until 16-16-16-18-18-18 sts remain on row, work BAND STS. Continue in garter st over the middle sts and 16-16-16-18-18-18 band sts in each side for 4 cm / 1½''. REMEMBER THE GAUGE! Then work in stockinette st with 16-16-16-18-18-18 band sts in each side. When piece measures 48-49-50-51-52-53 cm / 19''-19¼''-19¾''-20''-20½''-21'' , divide the piece 43-47-49-55-59-64 sts in from each side (= front piece, there are 74-82-88-98-108-118 sts on back piece), and finish each part separately. = 74-82-88-98-108-118 sts. Continue in stockinette st - AT THE SAME TIME at end of the next 2 rows, cast on 48-46-45-41-38-35 new sts for sleeve in each side = 170-174-178-180-184-188 sts. Continue in stockinette st - but work the outermost 6 sts in each side in garter st until finished measurements (= band on sleeve in each side). When piece measures 64-66-68-70-72-74 cm / 25¼''-26''-26¾''-27½''-28 3/8''-29 1/8'', bind off the middle 18-18-20-22-24-24 sts for neck and finish each shoulder separately. On next row from neck, bind off 1 st = 75-77-78-78-79-81 sts remain on shoulder. Loosely bind off all sts when piece measures 66-68-70-72-74-76 cm / 26''-26¾''-27½''-28 3/8''-29 1/8''-30''. NOTE: Make sure that the bind off edge is not too tight. = 43-47-49-55-59-64 sts. Continue in stockinette st and 16-16-16-18-18-18 band sts towards mid front - AT THE SAME TIME at end of next row from WS, cast on 48-46-45-41-38-35 new sts for sleeve = 91-93-94-96-97-99 sts. Continue in stockinette st and band sts towards mid front but work the outermost 6 sts at beg of row seen from RS in garter st until finished measurements (= band on sleeve). When piece measures 66-68-70-72-74-76 cm / 26''-26¾''-27½''-28 3/8''-29 1/8''-30'', bind off on next row from RS the first 75-77-78-78-79-81 sts for shoulder = 16-16-16-18-18-18 band sts remain for collar. NOTE: Make sure that the bind off edge is not too tight. Continue to work over these band sts until collar measures 7-7-8-8-9-9 cm / 2¾''-2¾''-3 1/8''-3 1/8''-3½''-3½'' from the shoulder. 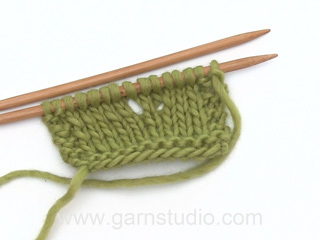 Then bind off at beg of every row from RS as follows: bind off 5 sts 2-2-2-0-0-0 times, 6 sts 1-1-1-3-3-3 times. Sew shoulder and sleeve seams in front loop of outermost sts. Sew collar tog mid back and sew on to neck line at the back of neck. Sew seams under sleeves in front loop of outermost sts. Worked back and forth on needle. Cast on 24-24-24-26-26-26 sts on circular needle size 5 mm / US 8 with Alpaca Bouclé. Then work in stockinette st. When piece measures 3 cm / 1 1/8'', inc 1 st in each side - READ INCREASE TIP. Repeat inc every 3 cm / 1 1/8'' a total of 3 times = 30-30-30-32-32-32 sts. Bind off all sts when piece measures 16-16-16-17-17-17 cm / 6 1/4"-6 1/4"-6 1/4"-6 3/4"-6 3/4"-6 3/4". Sew pockets on to front piece, approx. 10-10-11-11-12-12 cm / 4''-4''-4 3/8''-4 3/8''-4¾''-4¾'' from cast on edge and 12 cm / 4¾'' from mid front. NOTE: Right and left edge on pocket are sewn parallel with band mid front. Worked in the round. Loosely cast on 120 sts on circular needle size 5 mm / US 8 with Alpaca Bouclé. Work 4 rounds in GARTER ST - read explanation above. Then work A.1 in the round. When piece measures approx. 35 cm / 13 3/4"'' (finish with last row in pattern), work 4 rounds in garter st and loosely bind off all sts. 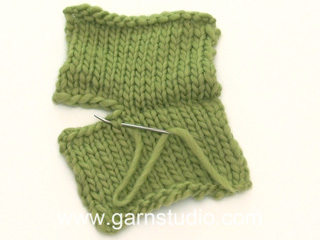 NOTE: Make sure that the bind off edge is not too tight. I would like to use a cotton/linen blend yard for this jacket. 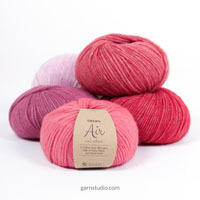 (Aran 8 wpi) Do you have any size suggestions / instructions for this weight? Thank you! 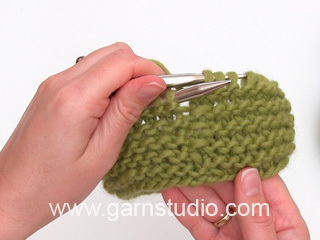 I love this pattern and want to use the yarn I have. Dear Mrs Smallwood, you can use here DROPS Bomull-Lin, please find here all relevant informations about alternatives. Happy knitting! Heb patroon exact gevolgd, steeds gemeten conform aanwijzingen, steekproef was goed etc. Toch was het vest al snel te kort en te wijd. En met het dragen werd dit steeds erger: het werd steeds korter en wijder! Ik kan het vest helaas niet meer dragen, het is helemaal uit verhouding. Ik heb ook poncho 133-4 gemaakt en daarbij gebeurt dit ook, alleen bij een poncho komen de verhoudingen minder precies, dus dan maar korter en wijder. Maar hoe kan het dat deze wol zo reageert na correcte verwerking? Hallo Yvonne, Dat is erg jammer om te horen. Voor klachten over het garen kun je het beste even contact opnemen met het verkooppunt waar je het garen hebt gekocht. Zij kunnen je eventueel verder helpen. Jeg bryder mig ikke om bouclé garn. Kan I anbefale en anden garntype til denne model? Hei Lene. DROPS Alpaca Boucle tilhører garngruppe C og du kan velge andre kvaliteter vi har i samme garngruppe. Om du ønsker ensfarget ullkvalitet kan du velge DROPS Brushed Alpaca Silk, DROPS Nepal, DROPS Big Merino, DROPS Air og DROPS Alaska eller multifarget ved DROPS Big Delight. Du kan også velge mellom DROPS Paris og DROPS Bomull-Lin om du ønsker bomullsgarn. Bare gå inn på oversikten over garn og velg kvalitet og farger, men HUSK å overholde strikkefastheten som er oppgitt i oppskriften. God Fornøyesle! Liebe Gina, die Abschrägung kommt nicht von verkürzten Reihen, sondern vom Abketten: "... Dann zu Beginn jeder Hin-R 2-2-2-0-0-0 x 5 M und 1-1-1-3-3-3 x 6 M abketten." Bonjour je suis entrain de faire la veste de grandeur large, j'ai diviser l'ouvrage de 49 mailles de chaque côté et de 88 mailles pour le dos. C'est la mon problème je ne comprend pas comment ugment les 45 mailles de chaque côté entre le 49 et 88 mailles sans mettre les 49 mailles en attentes. Je vous remercie de m'éclairer. Bonjour Mme Levesque, quand on divise l'ouvrage à 50 cm (en taille L), il faut mettre les mailles des devants sur des fils ou arrêts de mailles puis continuer sur les mailles du dos en montant les 45 m pour les manches à la fin de chacun des 2 premiers rangs - voir vidéo ci-dessous pour monter les manches. Bon tricot! Når en i begynnelden strikker stolpem 12 m 1 r/1 v og 3 m r og 3 v, må en da i slutten, på motsatt side ikke strikke disse 18 masker motsatt i rettningen? 3 v 3 r og 12 masker rille?